Are you ready to find that diamond in the rough? Are you ready to get that 6th round pick that scores like a 1st round pick? Well here are my top sleepers and on the flip side of that my biggest busts to watch out for in your standard leagues. Jamaal Charles RB- Kansas City. 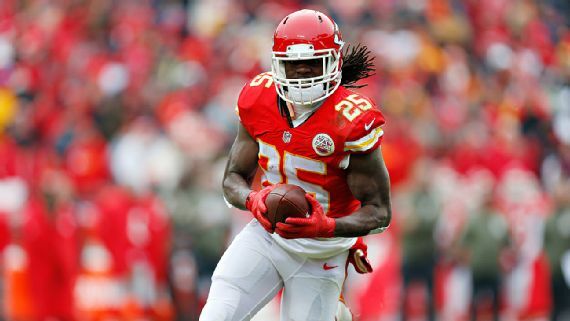 Ranked 22nd overall by ESPN and the 11th best running back Jamaal Charles falls into the number one spot on my sleeper list. Charles is a player that always produces unless he gets hurt. Charles is coming off an ACL tear that kept him out all but 5 games last year. In those 5 games Charles racked up 5 total TDs and averaged 5.1 ypc. I know that there are people who question his ability to produce after a torn ACL, but this isn’t the first time Charles has torn his ACL. Last time he did so, he ran for over 1,500 yards the next year. Charles has always been a standout running back as long as he didn’t get injured and if he can avoid that this year he will be a top 5 running back you can get in the late second or early third round. Allen Hurns quietly had a very solid second season in the NFL and had a very nice fantasy season as well pulling in 64 catches for just over 1,000 yards and hauling in 10 touchdowns in 15 games. Hurns is plagued by having Allen Robinson on the other side of the field and that undoubtedly hurts his potential to be a top notch wide receiver. But, going into his third year, Hurns could improve on the numbers he racked up last year and become a very solid WR2/Flex option for your team that you can get in the late rounds. Hurns is currently rated as the 35th WR according to ESPN and the 81st player overall which means you can safely get him in the middle of the 7th If the defense still falters next year and the Jaguars are forced to throw the ball as much as they did last year expect solid production from him over the course of the season. Ezekiel Elliot RB Dallas- Elliot is on this list not because he lacks talent but because I feel there is too much risk to draft him where he is currently ranked. Coming in as ESPN’s 3rd ranked running back and 6th overall player I feel that the risk associated with Elliot far surpasses the reward associated with him. Rookie running backs have failed to do well in the NFL in their first year in the league. There have been exceptions to this rule and Elliot may well be one of those exceptions but given the risk I wouldn’t recommend taking him in the first round, there are too many consistent top notch WRs to pick up. In fantasy, making a mistake with your first round pick makes getting into the playoffs or winning your league extremely difficult so don’t take that risk on Elliot in the 1st If Elliot falls to the second round he is worth considering, but even then the risk associated with Elliot would probably be enough to keep me looking elsewhere for production. Eddie Lacy RB Green Bay- Eddie Lacy has lost weight since last year’s disappointing season but did he lose enough? That is a question weighing on a lot of Packer fan’s minds coming into the season. Honestly, I don’t think it matters, I believe the Packers will use a “committee” style running attack using both Lacy and James Starks quite a bit in the back field. Even if Lacy is back to his past talent he will still largely be handcuffed by Starks and won’t see the production he has in the past at least at the beginning of the year. Remember, this is all assuming that he DOES return to his former level of talent and not the abysmal running back that looked slow, lethargic, and weak all of last season. There were times when he was running in the open field where he looked genuinely uncomfortable with the ball in his hands, worried about being chased down from behind when he had nothing but green grass in front of him. Given that he is projected as a late 2nd round or early 3rd round pick I would definitely recommend scouting around elsewhere to fill your needs at running back.